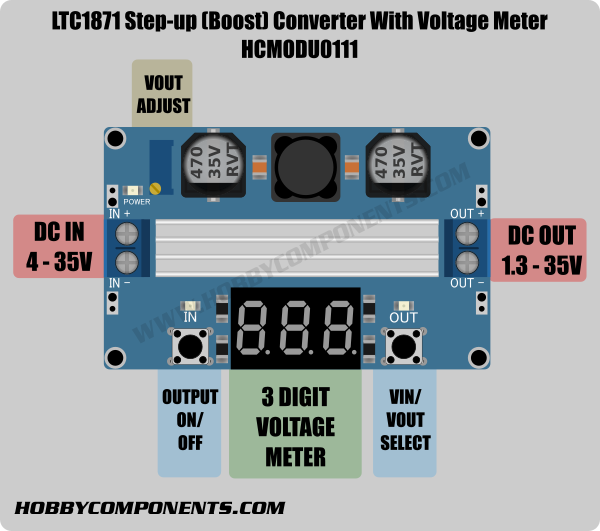 A compact but high powered DC-DC step-up (boost) power supply converter module. It features a wide operating supply range with a power supply input voltage between 3.5 to 35V and will step-up this input voltage from 4V to 35V. The module also includes an integrated voltage meter that can measure both the input and output voltages. A voltage selection button allows for easy switching between the two. Together with its high multi-turn precision potentiometer this means any desired output voltage within its supply range can be sent without the need of an external test meter. Additionally LED indicators show power and input or output metering. Maximum current is dependent on input and output voltages, ambient temperature and cooling. Maximum LTC1871 operating temperature must not exceed 125oC otherwise permanent thermal damage can occur. Do not set output voltage beyond the modules maximum operating voltage of 35V. The unit I received only has one PB to the right of the voltage display. How do I turn it On/Off? 2) Towards the top right of the label there will be a batch date - could you let me know what it is? it does. I've attached a photo of both. Thanks for the image. It looks like you have the wrong version of the module. I can see the label is correct but the module in your image is the step down version no the step up. Sorry about this, it must have somehow got mixed up and labelled incorrectly. Could you email sales [at] hobbycomponents.com and just reference this post and we can sort it out from there. I'll email as requested. thanks for the support.